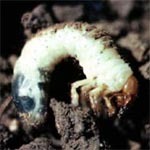 The white grub is a C-shaped insect with all 6 of its legs found directly beneath its head. It has a white body and the head of the insect is orange. 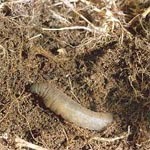 The grub feeds on the roots from May to September and the damage becomes most evident from June to September, as there are large brown patches of dead grass. This can be the most devastating insect, if it is not properly managed. These insects have long snouts, are ¼” long and are grey or black in colour. 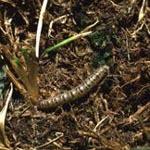 The larvae first feed on the grass stems and then move onto the root system. The insect does the most damage from July to early August when the temperatures are high and there is usually drought stress. The injury is visible in August and can be seen as off-coloured, irregular shaped patches of turf that turn yellow at first and then brown. 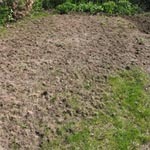 The turf can also be peeled back easily, as the roots have been eaten away. 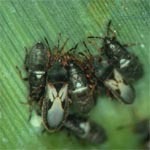 The chinch bug is a tiny red insect at first, but it gets darker as it matures. It has light coloured forewings, which form a very noticeable “X” on its back. 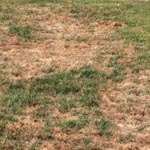 These insects love to attack turf when it is weak and that is usually during the summer in drought-like situations. The damage is noticeable from mid-July to mid-August and looks like small sunken areas in the lawn that rapidly turn into large dead areas. The larvae of this insect is known as the “leatherjacket.” The leatherjacket stage is when all of the damage occurs, as it feeds at or below the surface on roots. The damage caused by the leatherjacket occurs in May. At full size, it turns into a “European Cranefly” and this resembles a giant mosquito. The European cranefly is harmless to both humans and the turf. 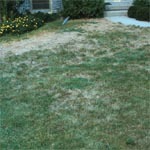 The sod webworm is at its most damaging as a caterpillar or its larval state. As the spring temperatures rise, it begins to feed on the turf blades. The adults emerge in May and June and fly in short zigzag patterns when you walk on the turf. 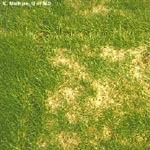 The early damage looks like scattered brown patches that lead to these areas turning brown as the feeding intensifies. The injury occurs during late August and early September.